By the beginning of the American Revolution, Maine occupied a buffer zone between English Nova Scotia and the rebels in Massachusetts. The English cut off supplies of gunpowder and shot to both Indians and the insurgent Americans, influencing the tribes to side with America in the conflict. In return for aid against the British, the Americans promised the tribes a priest, protection, and hunting and fishing rights. The British occupied much of eastern Maine during, and for a time after, the war. 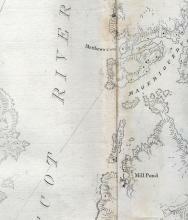 1734-1798. Royal Navy officer active in New England during the American Revolution. 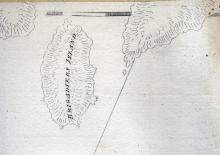 In 1775, as a Lieutenant acting under orders to harass the coast, he burned Falmouth ( Portland). By 1779 he was a commander and with three small ships successfully defended Castine against the Penobscot Expedition. By 1796 he had become the senior officer in command of the North American station. to burn Falmouth (now Portland.) He allowed the inhabitants one night to vacate the town, but rebellious militiamen fired on Mowatt, who fired back. At the end of the day, 400 buildings had been destroyed and the British had captured two American ships and sunk 11 others. Also Mi'kmag.One tribe of the Wabanaki Confederation. The original inhabitants of Nova Scotia and New Brunswick with some living in Maine and Newfoundland. gathered a force of 200 canoes, with which they attacked British coastal positions. The presence of so many Native Americans in Machias during the war helped that area remain securely within American control. Native tribe of western Maine and Quebec. One member of the Wabanaki Confederation. route. Nearly a third of Arnold’s men died, and another 100 were killed in the assault on Quebec. Although unsuccessful in capturing Quebec, Arnold’s march convinced the British to maintain a costly presence in Canada. It also illustrated the extreme obstacles Maine’s geography presents to travel—none of its rivers is navigable beyond Maine borders. An American who sided with the British during the American Revolution. during the war, and also gained control of other towns in eastern Maine. “Searsport’s Sam Houston,” was George Washington's aide, who crossed the Delaware with the General. 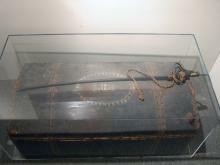 His trunk and sword have been recovered, due to efforts of a local teacher in Searsport, and are now housed at the museum. William Bingham, 1752 - 1804, was a delegate from Pennsylvania to the Continental Congress. After the American Revolution he used his wealth to purchase land, including about 2 million acres in Maine. This was known as the Bingham Purchase.. Political party founded by Thomas Jefferson and James Madison in 1802 to oppose the Federalists.. Knox died in 1806, not living to see the defeat of other Federalists in Maine and the triumph of Democratic Republicans, who eventually brought Maine statehood. Montpelier was razed to the ground in the late 19th century, but rebuilt in 1929. It is open as a museum today.